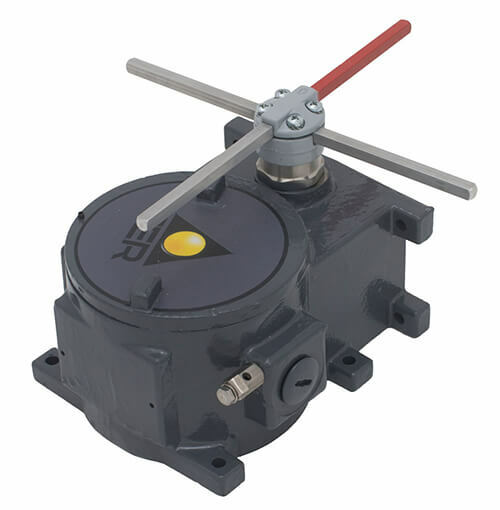 The Limitex AP expolosion proof position limit switch is designed to control the movement of overhead travelling cranes, hoists and machinery operating in hazardous / explosive environments. The Limitex AP is ATEX and IECEx rated for zones 1, 2, 21, and 22, with an IP66 rating, ensuring a dust and water tight design. The Limitex AP is tested and rated for operation in temperatures from -40°C to +60°C (-40°F to +140°F). The cross design has rods that move to 3 or 4 maintained positions with movement every 90°. The rugged enclosures is made of G20 cast iron and the cross rod support is made of a zinc alloy. The Limitex AP is designed to last. Available modular adapter with fixing points to simplify installation.